The LEFTOVER Design Factory founded in 2012 is made by the duo Alfred von Escher + Raffaella Guidobono. Everything started in Biennale Architettura 2012 with A Better World Collateral Event at the Greenhouse in Venice Giardini and with the set-up Antonio Marras Accessories F/W 2013/14. They delivered custom made furniture since then, re-styling private residencies, retails, bars, hotels. A youthful teamwork of craftsmen constantly exchange point of views manufacturing in 3 labs: a carpentry in BASE Milano, a container in Zürich and the prototype studio427 in a XVI Century Palazzo in Palermo. Sour series is the first collection of lamps, shelves, boxes by Leftover, born in 2017. Simple design, noble materials, soft colorpalette, valuable imperfections by craftsmanship. Thought as a structural solid trapezoidal form, made in brass. 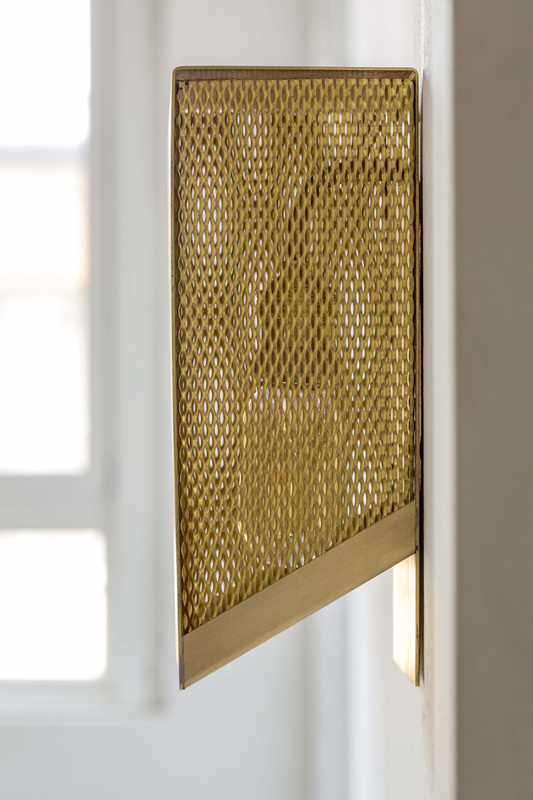 The form originate from an industrial air duct, giving the light a subtle direction, enclosing perforated sheets on both sides, the shade sits off creating a soft reflections. Available as applique or freestanding table lamp. Dimmable on request.